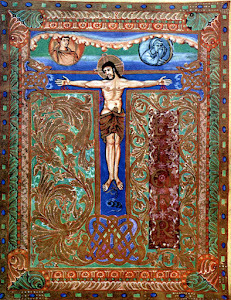 We are pleased to announce that the Solemn Paschal Triduum according to the Roman Missal of 1962 will be held in Toronto. The last two years we were thankful to the Carmelite Sisters of the Infant Jesus in Zephyr for hosting the Triduum at the Zephyr Carmel. Please keep our good friend, Sister Marie Therese, OCD, and the nuns there in your prayers. 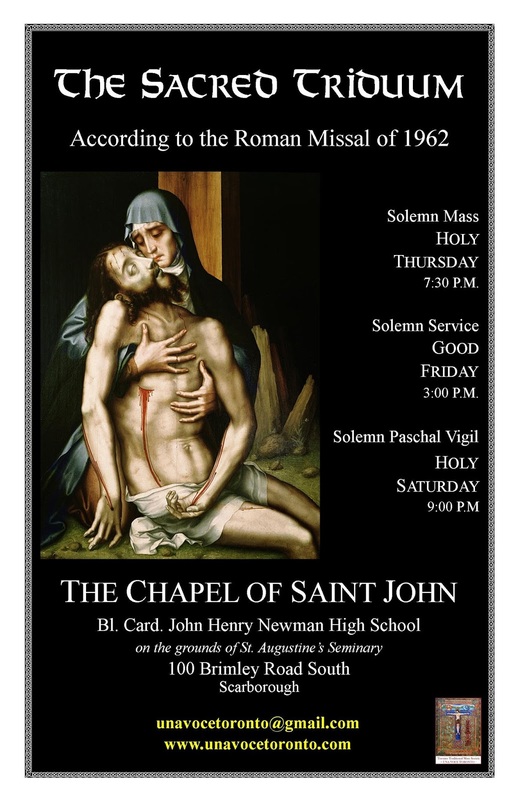 This year, we will be in Toronto at St. John's Chapel at Blessed John Henry Newman High School on the grounds of St. Augustine's Seminary. We thank the Rector of St. Augustine's Seminary, the Principal and Caretakers of Blessed Cardinal Newman High School and the Permit Staff of the Toronto Catholic District School Board for their support and cooperation. The large chapel is located on the west side of the school with entry from 100 Brimley Road South off Kingston Road in Scarborough on the grounds of St. Augustine's Seminary. All services will be in the solemn form with priest, deacon and subdeacon. If you wish to assist as a server or in the Schola, please contact unavocetoronto@gmail.com. Your financial support for this project is welcomed and necessary as there is a significant cost to the Toronto Traditional Mass Society for the permit, caretaking staff, insurance and liturgical items. Would you consider a tax-deductible donation today which you can do so online here at CanadaHelps? Since 1956 it is not to be anticipated but celebrated at its proper hours. The Oratory will have some kind of service tonight. The SSPX chapel will have Matins and Lauds, which is what Tenebrae is, on Thursday morning only at 8:00AM.